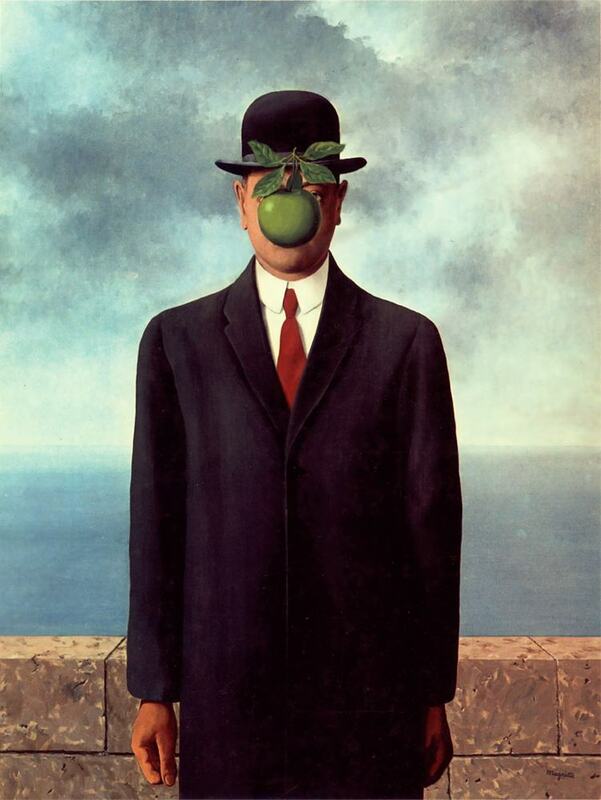 THE SON OF MAN, 1964 BY RENE MAGRITTE – © THIS ARTWORK IS POSTED ON THE SITE IN ACCORDANCE WITH FAIR USE PRINCIPLES. Rene Magritte, a talented surrealist painter, makes us reflect with curiosity. To better understand what Rene is trying to say, notice deeply and reflect on the following points by writing what comes to mind. What appears odd about this painting? Where do you believe this painting takes place? What emotions does this painting reveal? The apple is obviously more than just an apple. Why is the apple there? What does his face look like? Who is the man and what do you believe the painting is trying to say? Surrealism: an artistic and literary movement, dedicated to expressing the imagination as revealed in dreams, free of the conscious control of reason and convention. The apple is floating. The setting is at a bridge at china. Its mysterious and surprising. He probably has a mustash and beard plus a monkey nose. I Think he is saying laugh at me all you want im pretty on the inside not outside. Hi Molly. Thank you for sharing your thoughts. I like how confident you are in yourself. him.The emotions in this painting are sadness and loneliness. Why do you think the man got punched in his face many times? Is it because he is ugly and doesn’t want to be seen. I think appears odd about this painting is the apple. I think this painting takes place over the ocean on a bridge.I think the emotions it reveals are sad and suspishis. I think there is a apple to cover his face.I think the apple is floating because he’s biting the apple.I think his face has a black eye and a bump on his lip.I think it’s a thief and its trying to say if you steel stuff you’ll get beat up. The thing that’s strange is there is an apple on his face.I think the painting is taking place near the sea.The painting makes me feel curios.I think the apple is there because someone threw it.The way i think he looks like is he is smiling with wrinkles.I think the painting is trying to tell us it does not matter what your face looks like. i thought the sun of man was cool. Thank you. I’m glad you enjoyed the video. Tell us one detail you enjoyed. Hi Tiffany. Thank you for sharing your thoughts. If you could change the mans “cover,” what would it show? Go Natalie. I see you making sense of Rene’s quote.